Just one product for numerous requirements - that's why we developed VARIO BLEACH 3E. 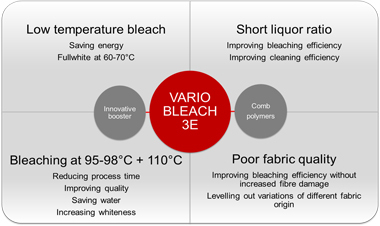 From low temperature bleach up to quality improvement in the HT bleach – with VARIO BLEACH 3E nearly all discontinuous bleaching processes can be diversified in a simple and inexpensive way. The secret of VARIO BLEACH 3E lies in the combination of innovative booster technology and special comb polymers.